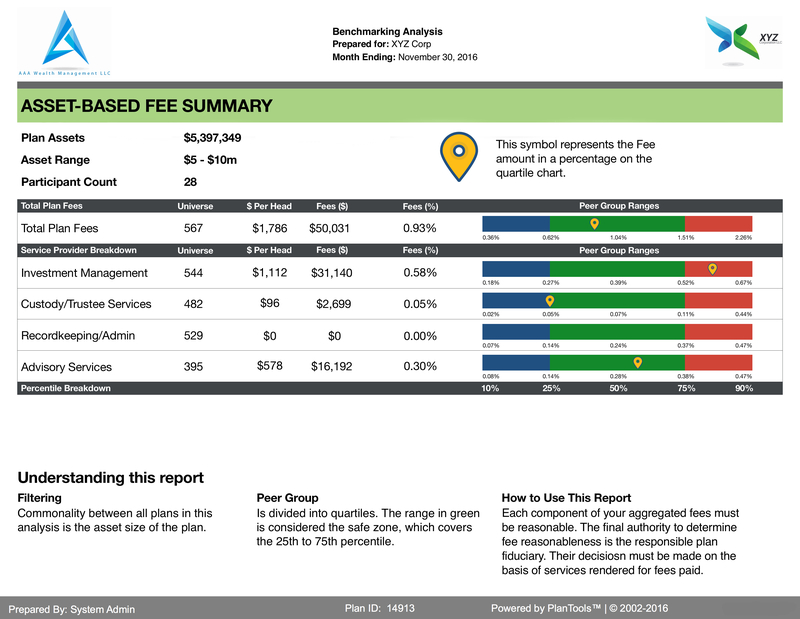 Fee benchmarking is a low cost easy method to assess the reasonableness of fees charged for services rendered by comparing a plan to similar plans by participant size and total assets using our proprietary, independent, and objective database. Based upon the benchmarking results, a fiduciary is able to document a prudent process to support their subjective assessment of each service provider’s value of services rendered accurately and efficiently. Nine categories and hundreds of services reflected on 18 different reports. Over 55,000 retirement plans organically entered by our database on actual plans. It takes 30 minutes to enter data and generate a report. Add disclosures once to apply to reports to meet 408(b)(2) requirements. Benchmark prospects with incomplete data without corrupting the database. Integrated with over 40+ different platforms to determine the amount of indirect fees. Benchmark plans by type including 401(k), 403(b), DB, DC, and ESOP/KSOP. Option 1: Gather the accurate fees and expenses to be benchmarked, complete, and return a data collection sheet, and within 48 hours receive your benchmarking report. The cost is $575. Option 2: Provide the underlying plan related documents such as service contracts and 408(b)(2) disclosures to FRA PlanTools for analysis and report preparation. The cost is $995. If you are a plan sponsor, local representation can be provided. Fiduciary Risk Assessment LLC is the consulting arm and parent company of PlanTools, LLC. PlanTools™ is a cloud based software-as-a-service company specializing in custom built and retail web-based financial solutions.